The Horse lives on! And not just in people’s hearts. Last September, two days after the Trojan Horse burned, Norm Tucker, a virgin Burner from Auburn, California, went to the remnants of the Horse to collect some Trojan hardware as mementos. There he met Ray Keim of Vancouver, Washington, the Leave-No-Trace Coordinator for the Trojan project, who was raking the ashes as part of the clean up. The next month, Ray delivered a truckload of Trojan bolts, braces, etc. to Auburn and the project began in earnest. Norm’s two sons and several campmates from his 2011 camp worked “a couple of thousand hours” building the all-steel structure, which they named, “Phoenix Risen.” Kathleen Hoffman kept the project going with her endless energy. Daniel Skirblah created the flame effects and had the eye for turning burnt and twisted metal into beauty. Norm, a facilities manager for an IT firm in the default world, is still working on the final touches, but 95% of the piece is complete with a week to go before showtime. The art will be displayed front and center in the 7:30 Plaza at G St. After dark, it will be illuminated in part by some of the 42,000 LEDs that lit the Horse. NOTE: Harly Payne will also be remembered by a reading of his poetry by family and friends at Shift Camp, 9:45 and A at 8 PM, Friday, Aug. 31, the anniversary of his death. Posted on August 21, 2012 by trojan	in Updates and tagged phoenix. 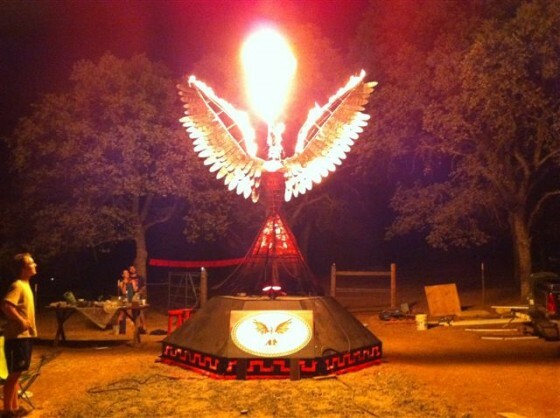 The Phoenix Rising was the most beautiful art at the playa this year. I was so lucky to be able to see it from my camp bed, so it was with me all the time. What will happen to the Phoenix?